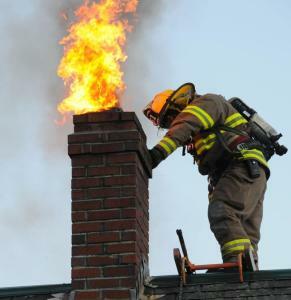 Here in Texas, the first step in house fire prevention is to get your chimney swept regularly! House fires are terrifying, dangerous, and the results are devastating. These fires consume your prized possessions, your treasured pictures, and in particularly tragic instances they can destroy families. When so many of these fires stem from avoidable accidents and negligence there is no reason not to make safety your number one priority. At 1st Choice Chimney in Texas, fire preventions is our aim. With regular chimney sweepings you can prevent a build up of the highly flammable creosote which is responsible for many preventable house fires. Make fire prevention a priority with annual chimney sweeping in Texas. Did you know that it is recommended to sweep out creosote buildup at least once a year and every six months if you burn wood and coal often? Many people let build up accumulate for years and years without a second thought, and it isn’t a problem, until suddenly it becomes a huge problem. It is better to spend a few hundred on annual sweepings than to end up with thousands of dollars in damage from the smoke, flames, and water. Ask any of the following three homeowners who recently suffered through house fires and 1st Choice Chimney guarantees that if they had it all to do over again, preventative measures would have been their priority. The first incident displaced a family of seven when the flames spread into the home. The building suffered severe water damage in the process of putting out the flames. Another incident caused $25,000 in damage to a beautiful home originally built in the 1800’s. The house is livable and no one was injured, but a look over by a professional could have prevented the whole unfortunate situation. Another potential tragedy was barely avoided when a house erupted in flames in the middle of the night. Luckily, the family of three escaped unscathed. Each of these incidents could have been avoided, if only the homeowners had employed services to remove the flammable build up, such as cleaning and sweeping. 1st Choice Chimney is dedicated to keeping you, your family, and your home safe with our services. Contact us today and schedule regular cleanings and sweeping to keep the creosote cleared out and your fires burning safe in the fireplace where they are supposed to be. There is nothing better than knowing that your home and family are protected!